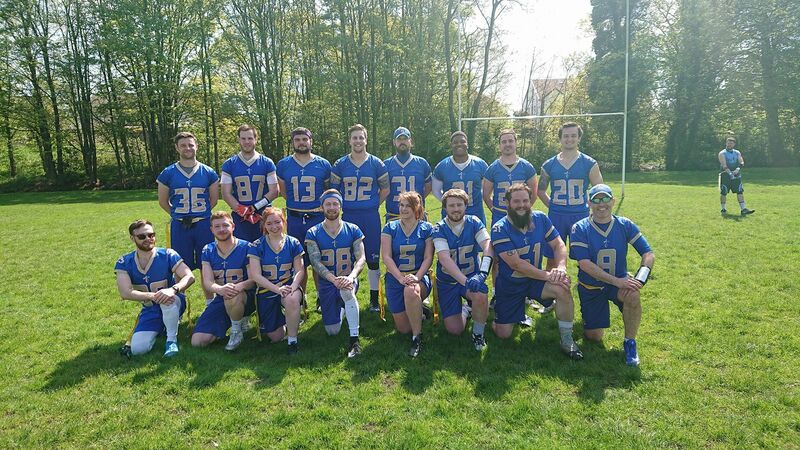 The MEC Premier Division leading Manchester Titans Adult Flag team went across town to the Crows home tournament on Saturday 14th July to take on the two Sheffield Teams and the Newcastle Blackhawks. Whilst the Titans were top of the table at the start of the day, they were only ahead of the Sheffield Giants due to head to head results. A loss would see them drop below the Giants and multiple losses could see them drop out of the playoff spots. 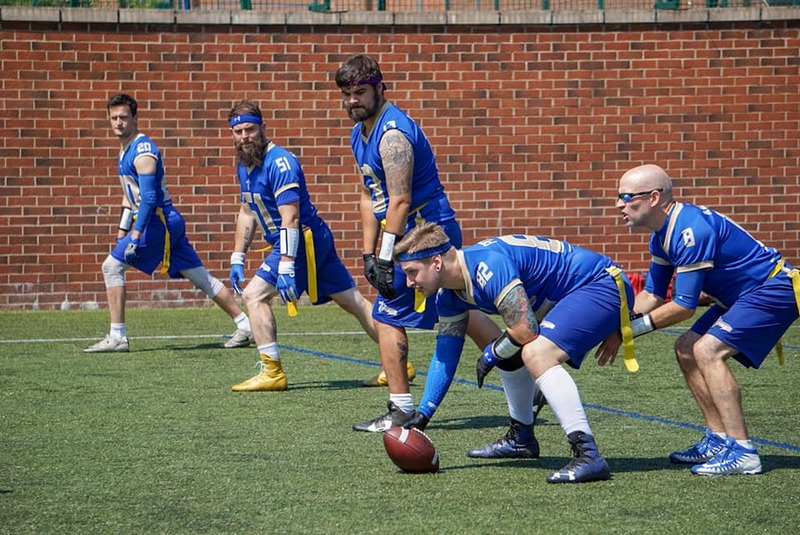 First up were the Sheffield Vipers who the Titans have beaten in the past, but the games have always been very close, in fact last year’s fixture was a thrilling 34-33 victory for the Titans. Both teams offenses moved the ball well to start the game, with the Vipers scoring first with QB Keith Woodley finding his favourite target Luke Bennett for 2 early TDs. Manchester twice drove down the field but twice came up empty in the Redzone. Eventually, the Titans got onto the board through Ben Nuttall, who also added the XP and the Manchester defense started to slow down the Vipers Offense. QB Alan Mead found David McInally down the right sideline for a 14-13 lead, but Sheffield came back with Bennett scoring his 3rd TD to go up 20-14. Mead then hit Jay Pitchford for the go-ahead score with McInally adding the XP to take a 21-19 lead. McInally then intercepted Woodley and the Titans appeared to be driving for another score but Nuttall dropped Mead’s 4th down pass. Sheffield took advantage by scoring with just over a minute to go in the game to take a 26-21 lead. But that was plenty of time for the Titans Offense who drove the length of the field before Mead found Nuttall in the endzone with 7 seconds to go, Rick McEwen’s XP gave Manchester a 28-26 lead for the Titans Defense to hold onto. Woodley’s Hail Mary pass was intercepted by McInally in the Endzone to seal the victory. 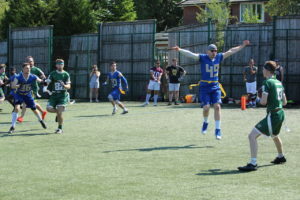 It was Nuttall’s 2nd game-winning TD of the season, after his exploits against the Crows in the first game of the year. The next game was against the Blackhawks, whom Manchester had beaten 41-7 earlier in the year. This time the Titans Defense, the Big Blue Wrecking Crew, shut out the misfiring Newcastle Offense with Ian Allonby and David McInally recording interceptions and Julie Gilmour logging her 4th sack of the season. Will Gleed also recorded a safety. 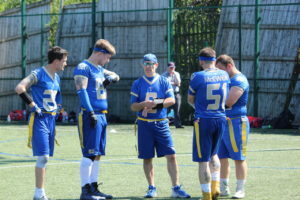 On Offense Alan Mead threw 5 TDs, 2 each to McInally and Rick McEwen, plus one to Jonatan Pan Gago, making his Flag Debut for the Titans after playing in Spain earlier this season. 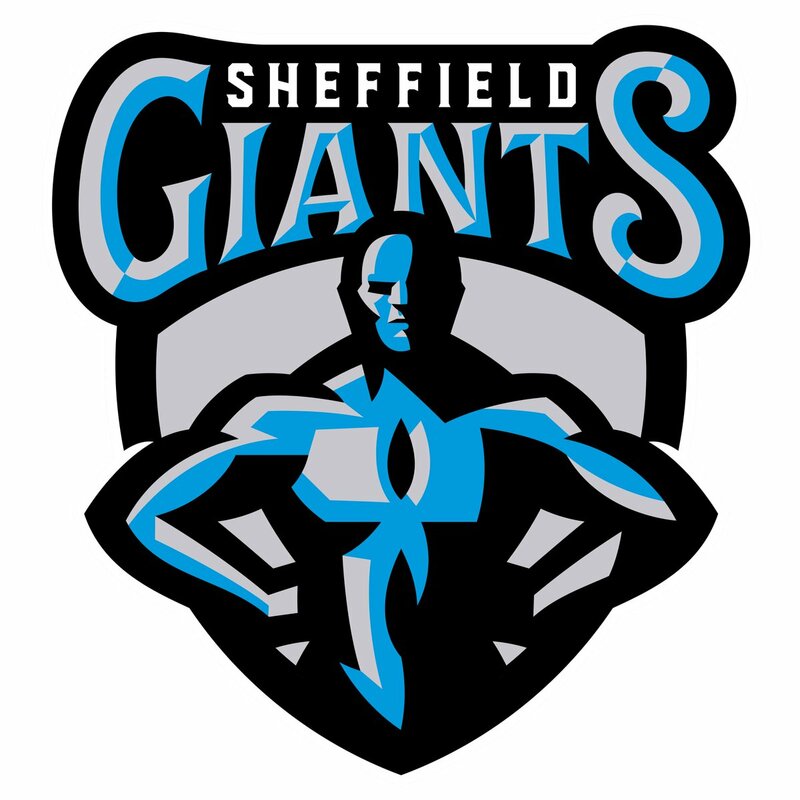 The final game of the day was the big one – the Titans had upset the Giants 35-12 in the first meeting of the year and the Sheffield outfit were looking for revenge in this fixture. Manchester drew first blood as McInally hookedup with Mead with Nuttall adding the extra point for a 7-0 lead. The Giants’ Dean Whittingslow answered back with a TD to Mantas Ceckauskas but the Titans scored again with Mead finding Rick McEwen on a bomb on 4th Down and then McInally scored again to take a 21-6 lead. But Sheffield scored before halftime through Liam Browne to bring the score back to 21-12. With just seconds to go before the break, Jay Pitchford made a diving catch in the endzone to give Manchester a 28-12 half-time lead. The Titans got the ball back to start the second half and Mead launched another huge pass downfield which McInally made a fantastic over the shoulder catch to score his 3rd TD of the game. Browne added a 2nd TD for the Giants but when McEwen skipped past a couple of defenders for another TD, the Titans started to pull away. McEwen’s 3rd TD was matched by Ceckauskas’s 2nd TD as the Titans ran the clock down to seal a 48-25 victory and a one game lead in the division with 2 games still to play. 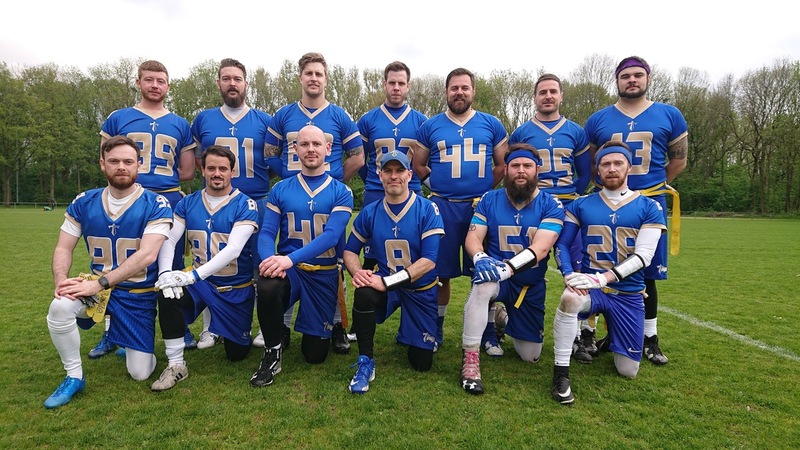 The 3 victories also ensured the Titans will be competing in the Premier Playoffs in August, with their final standing to be decided on 28th July as they take on the Leeds Samurai and the Manchester Crows.